6" nickel plated cable splicer's knife with a comfortable, non-slip grip, weighted handle. Platinum Tools Scissor-Run Electrician's Scissors - 5"
An original favorite, this smooth cutting action, scissor-run design is excellent for cutting Kevlar®, foil and wire. Cuts solid wire up to 16 AWG and stranded up to 12 AWG. Strips 19 and 23 AWG. Use on 110 style keystone blocks & jacks. 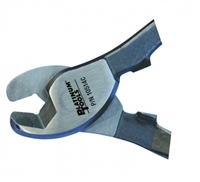 The Platinum Tools 8.5” Lineman’s Plier is a fresh take on a classic design. For gripping, twisting, bending and cutting wire and cable. The two-tone (TPR) molded comfort grip handle helps make any job a breeze.